This is an unexpected pleasure—a book about musicians that concentrates on what it means to play music and not on the tragic consequences of twisted genius or the cruel wages of fame. 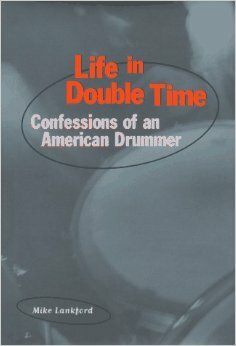 There is nothing about the recording industry, no tales of hotel rooms petulantly trashed in Mike Lankford‘s Life in Double Time: Confessions of an American Drummer. Lankford was carefully watching the crowds who were watching him and has written as authentic a report from the bandstand as I’ve come across. Who would suspect such insights from a guy who smacked things with sticks for a living? Born in 1951, Lankford belongs to a generation of musicians for whom craft was as important a guiding principle as art—often more so. As improbable as it sounds, the highest compliment you could pay to a high-school band in the ’60s was that it sounded “just like the record.” A pimply 16-year-old kid could count on plenty of girl reaction if his onstage Mick Jagger impression was deemed “authentic.” Many a white suburban Otis Redding found out what r-e-s-p-e-c-t meant, too. Believe it or not. In this post-punk world, one can become a musician by the sheer act of proclaiming it so. The punk revolution so thoroughly tore down the wall between stage and audience that now it’s not how well you play, it’s that you play that counts. If you are in the know, you are in the band. Fiddle with an instrument until it produces enough sound for your purposes, and count on getting booked into a club to perform. Craft is not the issue it once was. Which makes Lankford’s book almost an archaeological report—from the distance of 30 years. None of the many bands that Lankford played with wrote an original song. That wasn’t their purpose. The point was to play a variety of music together and to play with precision. By that standard was satisfaction judged. When a musician isn’t offering much that is obviously new, but is lost, as Lankford puts it, “so deep inside a tune, it became like four walls around me,” critics not unreasonably dismiss the result as “mere” musicianship, selfish expression. Double Time is filled with charming observations, as Lankford describes his development from geeky gawker at the teen club—paying closer attention to the stage setup of bands like “Dewayne and the Belldettas” than to the girls—to accomplished journeyman. When the drum bug fully hit, “melody ceased to exist for me,” he writes. On his first exhibiting drummer tendencies—while listening to a song on the car radio—his mother was so startled she drove home and took his temperature. “That was the start of my becoming a suspicious person,” he notes. The meat of the book begins in the early ’70s, when fresh-faced 20-year-old Lankford answers a blind phone call and finds himself sitting in with the group Salt & Pepper. He becomes the “salt” in a trio that includes two middle-aged black veterans from Chicago, Vince and Dennis. (Why they didn’t just change the band name instead of always insisting on hiring white drummers is not explained.) Dennis operates a Hammond B-3—that singular-sounding furniture-size keyboard that underscores so much of rock, R&B, and jazz—playing bass parts with attached pedals. Vince is an apparently inspired guitarist. After the first week, the trio packs the van and drives immediately to the next gig, 1,200 miles away, nonstop. Lankford spends the next three years on the road with Salt & Pepper, playing six nights a week, every week of the year. There are no vacations. Vince and Dennis had played together 30 years by the time Lankford joined and seemingly knew every tune ever written. To their young protégé, life on the road was an exciting adventure. The elder duo had a handyman’s approach to music: It’s a skill with which to earn money. So they spread their talent as broadly as possible. In some clubs, Salt & Pepper was a soul band, in others a rock band, in others a country band, and in certain swanky hotels, a mellow jazz group. One of those flavors was heroin. Lankford tried it, once. The not-unexpected reason why Vince never completely traded on his talent was his fondness for drugs. That was also why Dennis kept the band booked 365 days: idle veins, etc. Lankford is curiously blasé about his decision to sample. He professes to hate needles, but he didn’t just say no when offered the chance. Equating the drug’s effect with “slipping into angel skin,” Lankford makes a strong case for the complexity of the drug issue. That night the band’s performance was particularly inspired—Lankford claims to have experienced an epiphany about keeping time. Addiction is not just a moral weakness, he contends, noting that “the danger with heroin lies in waking up that one taste bud you didn’t know you had.” Lankford was aware enough to recognize a lesson and move on. Claiming immunity to stage fright, Lankford relates clear-eyed accounts of performing in places that should have scared him. He witnessed murders, nearly got stabbed, and was branded with a white-hot coat hanger. Lankford’s account of van-club-hotel, van-club-hotel—with gas-station rest stops and diners in between—is exhaustingly exhilarating. Ultimately, the grind took its toll, and Lankford said goodbye to Vince, Dennis, and the road. When he left Salt & Pepper, Lankford abandoned music completely, to the point where he claims to have virtually stopped listening to it or seeking it out in clubs. While Lankford’s notes from the stage are engagingly specific, the “confessions” part of the book’s title is a bit misleading. We have no idea what he did in the 15 years he wasn’t playing music, nor what he does now. Press materials mention that he’s a graduate of the Iowa State writer’s program, which shows. As Mick and Keith have demonstrated, giving up rock and roll is difficult. Eventually, Lankford’s now-middle-aged friends talked him into joining a weekend group. Slowly, reluctantly, he found his way back into music. At first he scorned his contemporaries for “pretending” to make music. But finally, timekeeper Lankford came to a deeper understanding of the nature of time—that life is to be savored moment to moment, not with an eye to the set list. Playing music is a great way to spend time. And there’s only one reason to play: for the hell of it. So the next time you’re at some wedding, don’t laugh too hard at the band. They may be having more fun than you.